Learn how to you can have a poinsettia rebloom every year. Instead of throwing it out after the holidays, keep it as a houseplant. If someone gives you a beautiful poinsettia this holiday season don’t throw it out after the festivities are over. Keep it as a houseplant and you will be rewarded with pretty blooms next year. A few years back I created this easy poinsettia centerpiece for our Christmas table. After I cut off the blooms I kept the plant with my other houseplants in the dining room and watered it around once a week. As you can see it quickly grew back. I wasn’t sure if it would turn red again but low and behold in February, a year plus later, this plant is in full bloom. And, I did nothing but water it and give it some supplement light along with my other plants. Now it would have been nice to have it bloom at Christmas instead of February. So I did some research and found that the key to getting them to rebloom is to make sure that they receive long periods of darkness in late fall or early winter. Most suggest around 14 hours. You can do this with a dark bag or box manually by covering the plant in the early evening and removing it in the morning. Here are detailed instructions for those eager to try this process out. P.S. Did you know that the colorful petals on a poinsettia are not flowers but leaves? The tiny yellow part in the center is the flower. Click here for more fun facts about poinsettias. 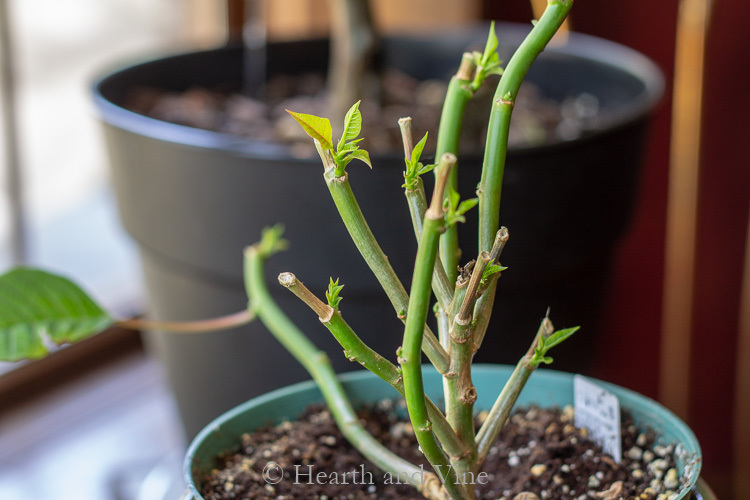 It’s early December as I write this post and the same poinsettia plant is just starting to go into red mode (see above). I think since I live in Pennsylvania where we naturally have shorter days might be the cause, even though I haven’t done anything new. So I’m pretty sure that it will not be in full bloom come Christmas, but that’s okay with me. I plant my poinsettia plant outside when weather is warmer and it makes a beautiful green plant. I bring it in before frost are to cold and have tried to get it to rebloom but have not had any luck. Our basement may be to cold, but I do use plant lights on my plants. I water them 1st of month but do not use any fertilizer. I will try again since I have 3 new plants now. JoAnn, I’m sorry to hear that yours are not reblooming. I’d check out this post from my friend Melissa which is very extensive. Maybe it will help. What a blessing this post is, Patti! Every year my mom in law always buys me a Poinsettia for Christmas. I don’t have the heart to tell her, but every year I somehow find a way to kill it! Thank you so much for the tips! I would really love to save this one! 🙂 Wishing you and yours a VERY Merry Christmas and a joyous and healthy New Year! Thanks Christine. It really seems to be happy with little help from me. I still have it in the same nursery pot it came in. You can always put it in a pretty pot that’s a little bigger, nursery pot and all if you don’t like the look. Just make sure that the bigger pot has drainage or double check that the poinsettia isn’t sitting in water. I’ve killed many a plant with too much water and not enough drainage. Merry Christmas to you too and I wish you a Happy, Healthy and Prosperous New Year. This is so great and you are absolutely correct the center is the flower and so many people don’t realize that. I remember learning that when I worked in a floral shop years ago. We should get hundreds of poinsettia’s in beginning around thanksgiving and caring for them was all about keeping that soil moist. Great tips!